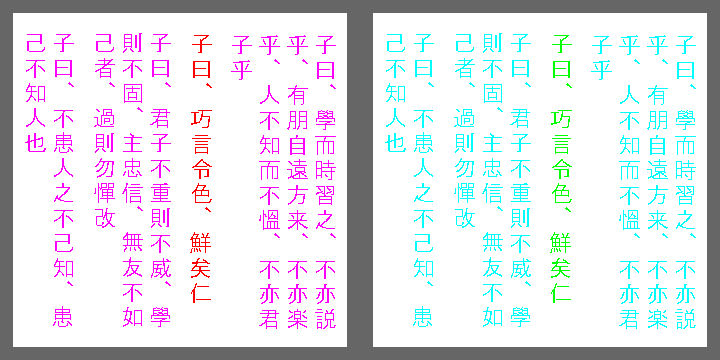 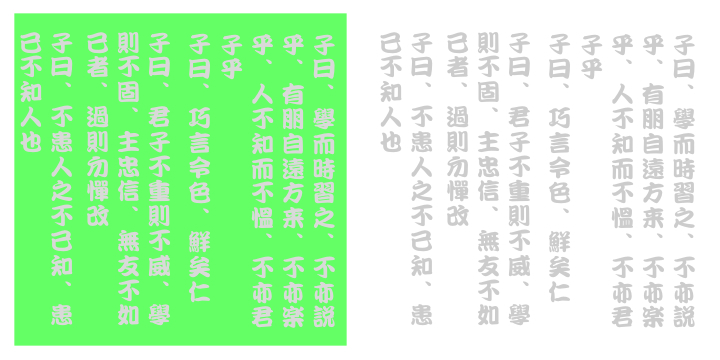 The left characters appear to be bluish while the right ones yellowish-greenish, though both are the same color. 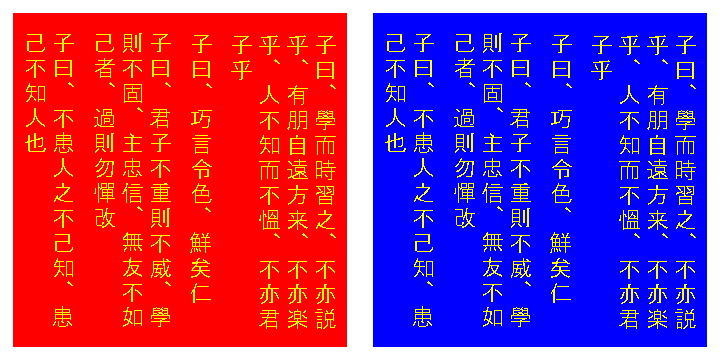 The left red characters appear to be slightly bluish while the right ones slightly yellowish, though both are the same color. 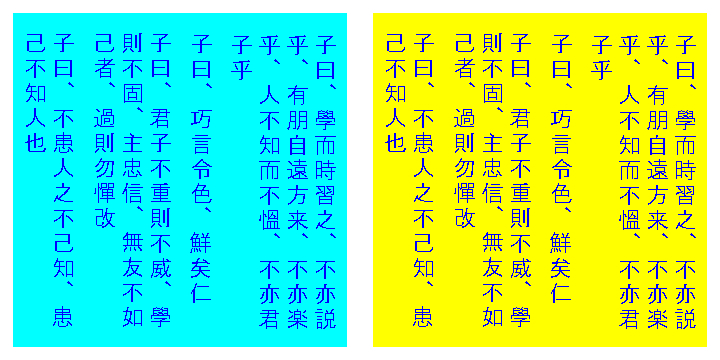 The right characters appear to be less vivid than the right ones, though both are the same blue. The right characters appear to be less vivid than the right ones, though both are the same yellow. The left green characters appear to be slightly bluish while the right ones slightly yellowish, though both are the same color. 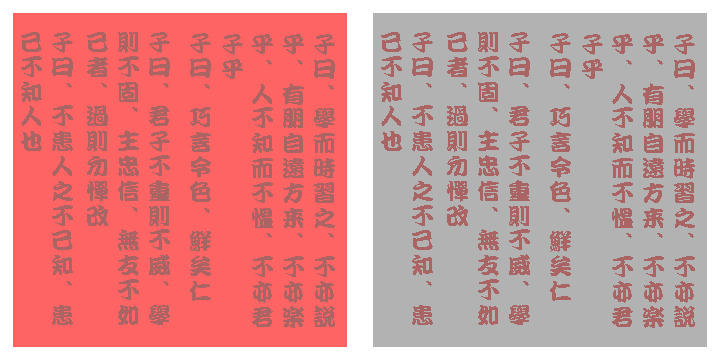 The gray background of the left image appears to be slightly tinted reddish. The left background appears to be slightly bluish while the right ones slightly yellowish, though both are the same red. 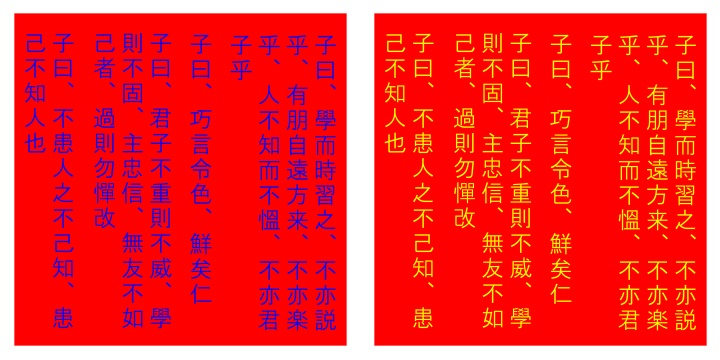 The gray characters appear to be slightly tinted reddish in the left image. 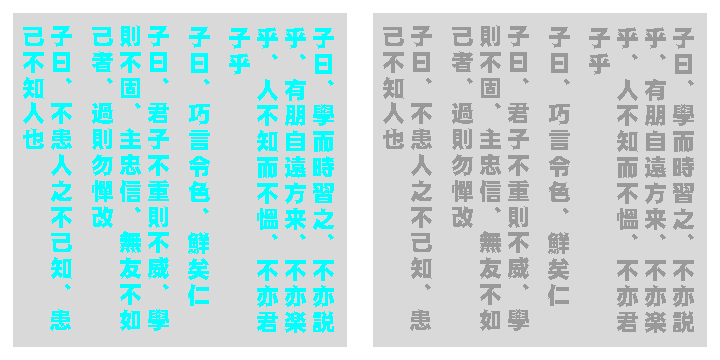 The gray characters appear to be slightly tinted pink in the left image. 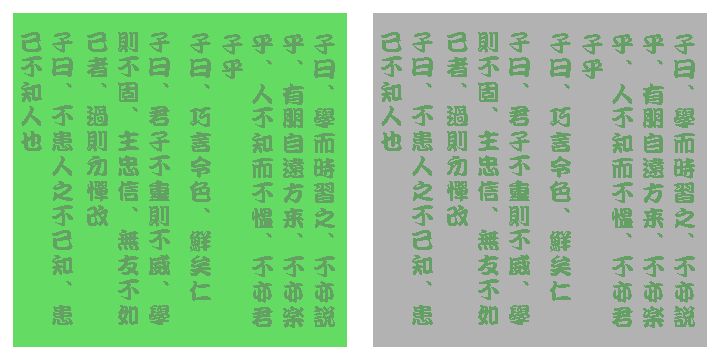 The gray characters appear to be slightly tinted greenish in the left image. The orange characters in the left image appear to be yellowish while those in the right image appear to be reddish. 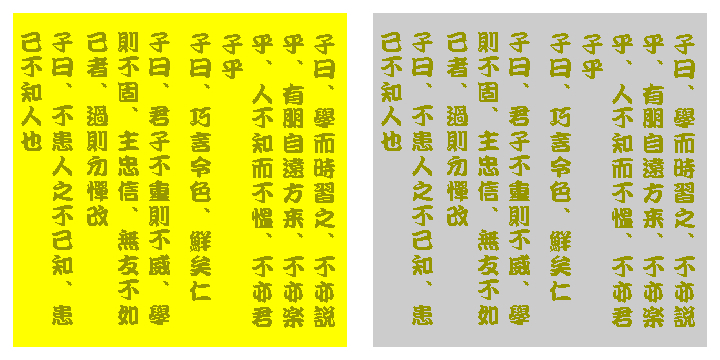 (The master said, "Resort to smiles and blandishments is a demonstration of a cold heart") in the left image appears to be yellowish while that in the right image appears to be reddish. 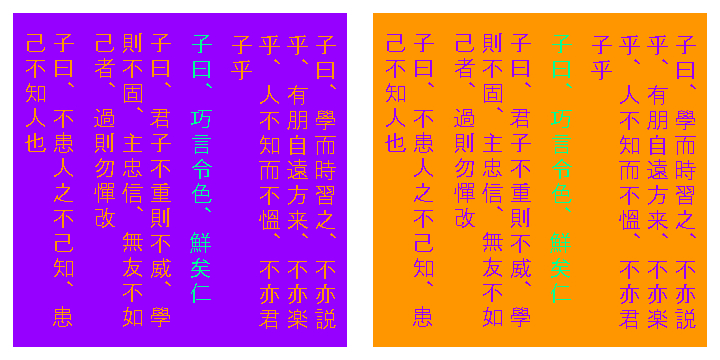 The left background appears to be slightly dark while the right ones slightly light, though both are the same luminance. 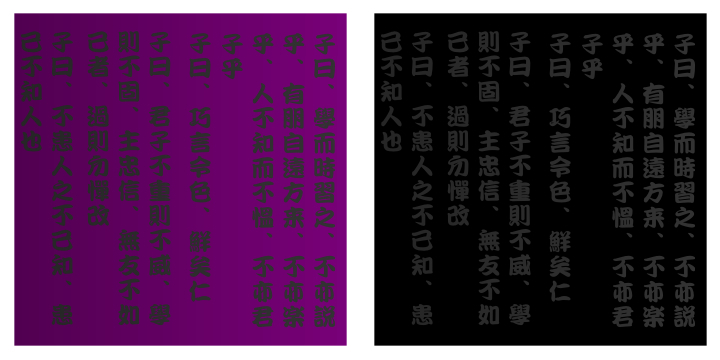 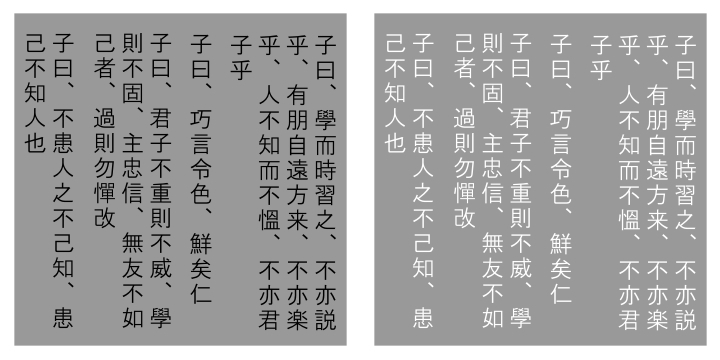 The gray characters in the left image appear to be brighter than those in the right one, though they are the same in luminance. in the left image appears to be brighter than that in the right one. The characters in the left image appear to be less vivid than those in the right one, though they are the same color. The characters in the left image appear to be less vivid than those in the right one, though they are the same color. 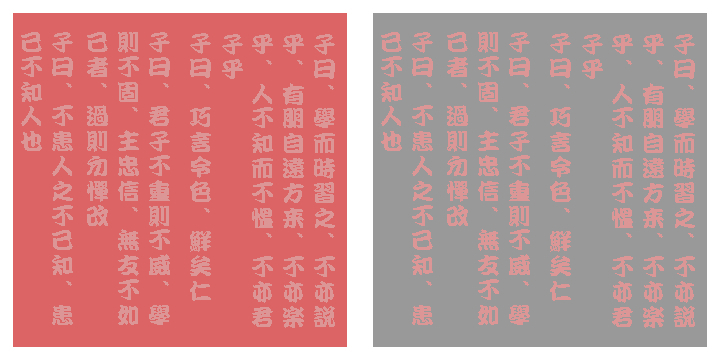 The former sometimes appear to be tinted reddish. 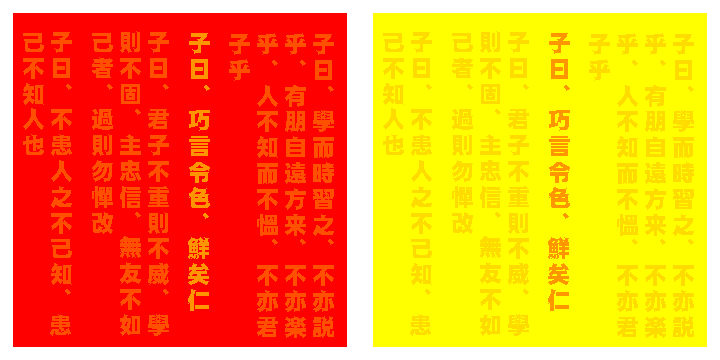 in the left image appears to be more yellowish than those in the right one, though they are the same red. in each image appears to have a yellowish veil, though the background is homogeneously white. "Reverse color assimilation and remote color contrast"
in the left image appears to be bluish while that in the right one appears to be greenish, though they are the same in color. "Reverse color assimilation and remote color contrast 2"
in the left image appears to be bluish while that in the right one appears to be greenish, though they are the same red. "Reverse color assimilation and remote color contrast 3"
in the left image appears to be more vivid than that in the right, though they are the same blue.